Of all the tree fruits we grow, my favourites are the Asian pears. The small trees top out at only 12 to 20 feet (3-6 m) tall, making them easy to maintain. Plus, they always make a good crop. Sometimes called Nashi pears or apple-pears, crisp and juicy Asian pears are delicious fresh, and even better when dried into sweet, chewy morsels. Native to China, Korea and Japan, Pyrus pyrifolia is hardy to -10°F/-23°C (about the same as Bartlett pears) but the trees have low winter chill requirements (500 hours, typical of US Zone 8). Trees start bearing about four years after planting and keep producing for at least 20 years. Growing Asian pears is easy if you have a sunny, well drained site with a slightly acidic soil pH around 6.5. The trees are partially self-fertile and some varieties can share pollen with European pears, but it is still best to plant two Asian pear trees to enhance the performance of pollinating insects, who dive deep into the white blossoms to fertilise them. Asian pear varieties vary in their growth habits, which can be spreading or upright. The spreading ones are easiest to manage, but fruit quality may be better with upright growers. Resistance to the common disease called fire blight is important in my climate, and many cultivars have this talent, including ‘Shinko’, ‘Kikusui’, ‘Korean Giant’, ‘Shin Li’, ‘Yoinashi’, and others. If necessary, use wire fencing to protect young and old trees from unwanted browsing by deer. In later winter we prune the trees to take out broken branches and sprouts, removing up to 20 percent of the total mass of the tree. Our goal is to keep the spreading branches open to good light. Because Asian pear trees are naturally small, the job goes quickly. Fruit thinning is often required when growing Asian pears, too. In some years the trees set so much fruit that the green fruit clusters must be thinned to prevent complications of over-producing – broken branches, small fruit, and reduced crops the following year. We use small scissors to clip out all but the two or three biggest green fruits in every cluster we can reach. It’s a slow, methodical process, rather like weeding, but once it’s done the benefits go on all season. Once Asian pear trees pass their prime years, they set less fruit and need less thinning. The same codling moths that bother apples can damage Asian pears. Use pheromone-baited sticky traps to reduce populations of this damaging pest. Asian pear trees hold their fruit until completely ripe in mid to late autumn, depending on variety. When wind knocks a few fruits to the ground, I start testing for ripeness by rocking fruits back and forth in my hand. Those that break off naturally are ripe. Asian pears bruise easily, so I handle them like eggs while gathering and cleaning them. The ripe fruits must be stored in the refrigerator, or they will deteriorate quickly. A tree’s worth of fruits will overrun a fridge, though it’s easy to make good trades with this gourmet fruit (I have a standing trade offer with a friend who makes superb goat's cheese). Still, there are extras. Of the many methods I’ve tried for preserving Asian pears, I like drying best. A quick run through the dehydrator concentrates the sugars in Asian pear slices while causing the crisp flesh to change to leathery. The result is a delicious dried fruit to eat out of hand or add to hot cooked cereals. 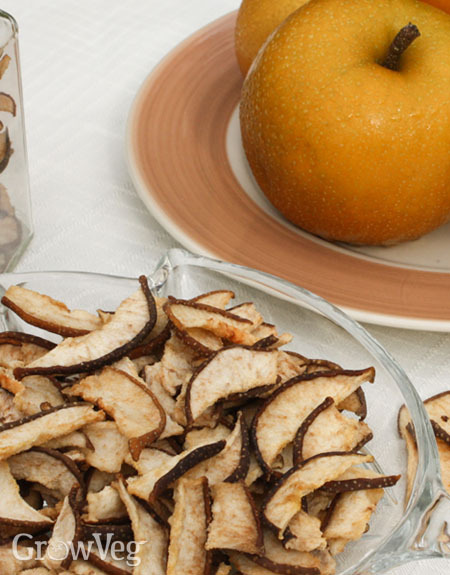 Cut into small tidbits, dried Asian pear can be substituted for raisins in most recipes. Asian pears have been grown in China for 2,000 years, and have been treasured in Japan since the 8th Century. Maybe it’s time you tried growing Asian pears, too.